Movie Watchlist lets you keep track of the movies you want to watch. Now it's easy to keep track of the backlog of movies. The app keeps a simple list of the movies you want to watch. When adding a movie you have the choise of doing a web search for the movie; doing this executes a search on IMDb and returns genuine results from the largest and most extensive movie and tv database on the web. You can get more information about the movie by opening a specific info page about each movie. All the info on this page is fetched directly from IMDb. 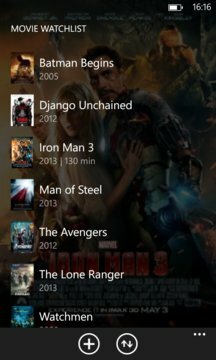 Movie Watchlist also has you covered if you are changing phones or has any reason to fear that your entire collection should disappear. Easy integration with SkyDrive let's you back up your lists to the web.